April | 2015 | Does This Font Make Me Look Fat? Sometimes it’s all about the wine. Casal Garcia. 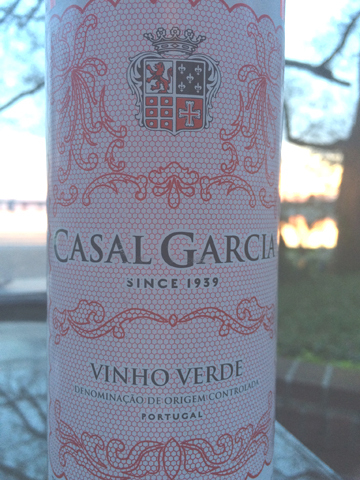 A faintly effervescent rose Vinho Verde from Portugal. 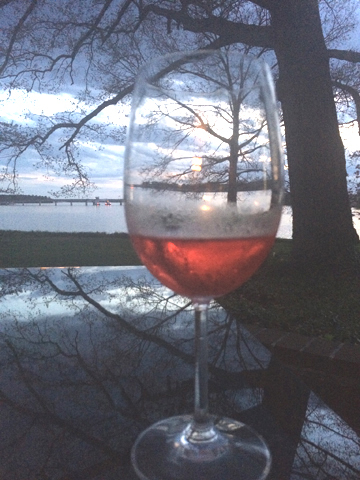 A perfect spring wine! 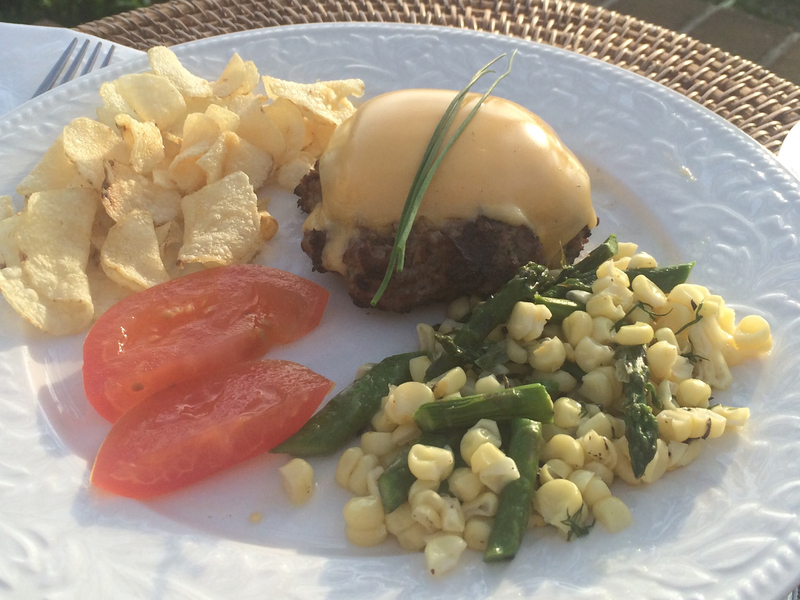 Paired with the first outdoor hamburger grilling of the season topped with a healthy slab of (Velveeta) cheese. Oh, yeah, I went there. And it was awesome. I’m still drooling. Added potato chips, some nuked (that looks weird!) fresh corn and asparagus in butter, and a side of applesauce. Yum! Note from Mala: Is Velveeta cheese? I’m not sure. But it does make a very creamy base for cheese sauces. My favorite real cheese is Manchego sheep cheese with a little bit of quince paste on top. And a glass of wine. Let’s not forget the wine! I love cooking. I love cooking shows. I love talking about food. Ask friends, and even not so close friends, I love talking about food. I actually drool. Seriously. It’s disgusting. 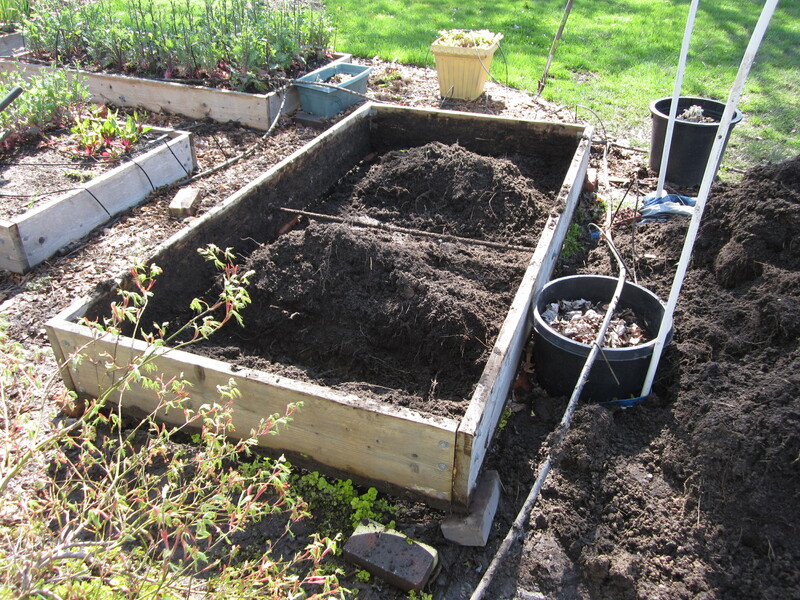 I love thinking and writing about food and once penned a screenplay called Secrets of the CIA. No, not the spooky alphabet agency- the Culinary Institute of America. Mala and I manage to add food into just about anything we write. I just plain love food. From pate and caviar, to Big Macs and fried bologna sandwiches, count me in. And Bugles? Don’t get me started. They make the BEST witchy fingernails ever and then – YOU GET TO EAT THEM!!! Does food get better than that?? The subject of dinner comes up in the office every afternoon and especially when Mala and I are writing. We tantalize each other with what we had the night before or what’s to come tonight. 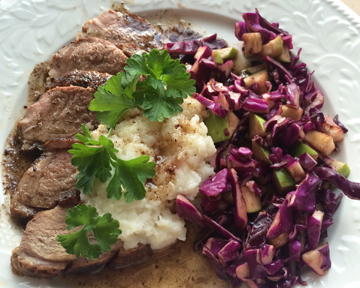 Seared duck breast medallions with parmesan mashed turnips drizzled with a brown butter duck jus and a red cabbage/Granny Smith apple, honey and balsamic vinegar slaw. Pan sear duck breast in butter/olive oil. Then put in oven for 10-20 minutes at 350 degrees. Chop ¼ of red cabbage, ½ Granny Smith Apple and add honey and Balsamic to to taste. Refrigerate. Smash/rice/whip turnips. Add butter, parm, cream, etc. (whatever you have). Salt and pepper EVERYTHING. To taste. Note from Mala: Laura’s plate looks like it came from a restaurant kitchen. Mine never look like that. I love cooking, but we have a lot of food sensitivities in our household which makes cooking challenging. Laura has inspired me to try to make my plates prettier. But her comment about lingerie? Just ask my lucky husband. In our last Working Writers Forum one of the members talked about getting into the zone with his writing. He said when he was in that place he seamlessly moved forward. Wikipedia gives this definition: zone is the mental state of operation in which a person performing an activity is fully immersed in a feeling of energized focus, full involvement, and enjoyment in the process of the activity. I’m working on the third book in my Caribbean romantic suspense series, but getting in the zone has been difficult. In part because it has been ten years since I wrote the last of book. It’s set in the Caribbean on the island of St. Lucia. We had a home there for many years and I was on the island frequently. It was easy for me to imagine the settings, the smells, the sounds. We sold that house about the time the second book in the series was published. It’s harder to get into the Caribbean zone now. My other problem is that my zone doesn’t happen all in one stretch. It comes and goes. Something like what happens to our Direct TV when we have a heavy rainstorm. This morning at my yoga class we settled into savasana, the deep relaxation at the end of the class. Suddenly I was in St. Lucia, in the Castries market place on a busy Saturday morning. This was not relaxing! 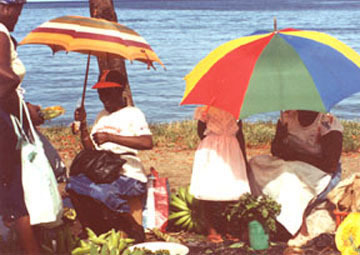 I walked through the outside venders, past women under colorful umbrellas, piles of produce arranged around them. Past the fish guy, his cart full of this morning’s catch. Inside the market building, I headed for a booth in a dark corner where an old woman was selling herbs and bush remedies. I seemed to know where I was going. Clearly this was a scene I’m supposed to put in the book. Bush medicine is part of the story. But, accessing the zone during savasana? Hello, Brain. You are not cooperating. Why can’t I be more in the zone when I’m at my computer? Why do those moments seem to happen in the middle of a steamy shower, at 3 in the morning when I’m snugged into a warm bed, or on a long walk when I’m a mile from the house with no paper or pen in my pocket? It’s probably left and right brain issues. I’m wondering how I can make my computer space more Caribbean. Maybe that would help get my zone on a more reliable schedule.